★★★★ The Independent An old man sits on the ground, his feet clapped in stocks. But he doesn’t much want rescuing – in fact, he could do with the sit down. Welcome to the bleak, comic world of Shakespeare’s King Lear. Andrew Hilton’s new production at Bristol’s Tobacco Factory takes a while to warm up, but once in its stride, this is a Lear that appals, shocks and saddens – just as it should. John Shrapnel tackles the monumental central role, creating a Lear who morphs by slow degrees from a stout, swaggering patriarch to a crushed shell of a man. In an exquisite exchange with his fool (played perhaps a touch too wisely by Christopher Bianchi), this Lear is gently stripped of all majesty even before the end of Act One. As Lear begins to lose his mind, Shrapnel becomes unsteady on his feet: as if only recently aware of his body. 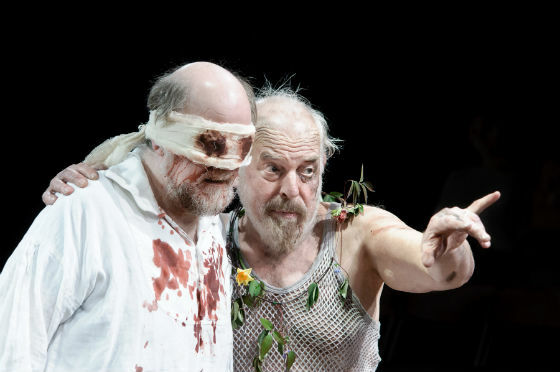 Wandering the moor during a fierce tempest, Lear and his fool meet, first, Kent – played brilliantly by Simon Armstrong – and then the newly blind Gloucester (Trevor Cooper), a poignant symbol of the twists of fortune. Scenes laden with subtext are deftly handled by Hilton and his ensemble. Away from the biting wind, Lear’s daughters Goneril and Regan (Julia Hills and Dorothea Myer-Bennett) are wrapped in luxurious velvet. They are a terrifying team, goading each other on to ever more shocking deeds. Myer-Bennett’s Regan is a woman thrilled by violence: trembling and sneering as she watches her husband (the Duke of Cornwall played by Byron Mondahl) pluck out Gloucester’s eyes. The wronged, innocent daughter, Cordelia, meanwhile, is played persuasively by a doe-eyed Eleanor Yates. This is a production that has confidence in the power of Shakespeare’s text. The only element that jars is Harriet de Winton’s design – the production begins in lavish Elizabethan costume, but as the play goes on, modern touches appear. The men wear combat trousers, Edmund (Jack Whitam) dons a leather jackets and, in the final act, Lear is brought on in a very modern wheelchair. ★★★★★ Whats On Stage The Shakespeare at the Tobacco Factory seasons have been one of the glories of Bristol theatre for the past decade or more. 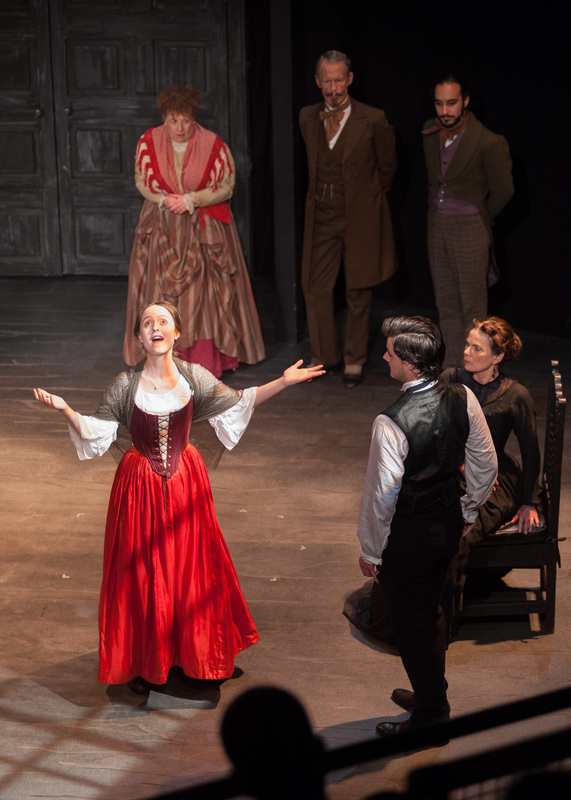 Each show feels like an event: the 240-seat theatre is always packed, the audience contains more than its fair share of young people, and the plays are staged in the round with exemplary clarity and immediacy. Director Andrew Hilton has built up a real ensemble of excellent actors whose work together has become richer and deeper over the years; it is a real pleasure to see actors of the calibre of Simon Armstrong, Alan Coveney and Byron Mondahl return again and again. On occasion Hilton has brought in a leading actor from outside who has melded into the company with apparent ease. Last year John Heffernan was an impressive Richard II; this year John Shrapnel, possessor of one of the richest, most glorious basses in the business, tackles one of the pinnacles of Shakespearean drama. Wisely Andrew Hilton is not too specific about the setting of the play (Shakespeare isn’t either): Harriet de Winton’s costumes initially indicate we are in the early 17th century; later on the greatcoats and wheelchair give an early 20th-century feel. King Lear doesn’t require historical detail; man’s place in the cosmic system and human nature are at the heart of the play, not politics and society. In this production Gloucester’s ‘As flies to wanton boys are we to the gods; They kill us for their sport’ and Edgar’s ‘The gods are just, and of our pleasant vices, make instruments to plague us’ carry equal weight; the audience is free to decide itself what justice there is in this world. Shrapnel is an outstanding Lear. He captures the vanity of a monarch whose every whim is indulged, the terrifying fury of a bully whom no one has ever dared counter when his beloved Cordelia ruins his opening charade, the movement from bitterness at his treatment at the hands of his elder daughters to anguish at his own folly and a humbled realisation of the wrongs he has done to others. Other actors give performances of equal distinction. Julia Hills’ Goneril and Dorothea Myer-Bennett’s Regan are more than mere malignity; in the opening scene their distress at what is clearly yet another of their father’s rages is palpable and their diminishing fear as they humiliate him and their own rivalry takes over are beautifully charted. Christopher Bianchi makes the Fool, which can be one of the most thankless roles in the canon, both funny and touching. Jack Whitam makes a suitably villainous Edmund, able to get a laugh from a simple adjustment of his collar. Simon Armstrong’s Kent is the moral heart of the evening. There is not a weak link in the cast. The production is fluid and fleet. Time and again simple directorial decisions illuminate character and meaning. Regan’s slow backward walk as she suggests her father return to Goneril’s home and apologise to her is the action of one who is still fearful of her father’s reaction but a slyly provocative withdrawing from him too. Gloucester is more of a comic bumbler than is usual. The interval comes at the end of Act II, earlier than most, but it feels apt: the King of the first half is an outcast in the second, and his long progress towards reconciliation is uninterrupted. Lear’s tender hug of the Fool as they enter the hovel and of Gloucester when they recognise each other are moving gestures of compassion and stages on his path to understanding his folly. ReviewsGate Clarity and logic result in an exciting Lear. 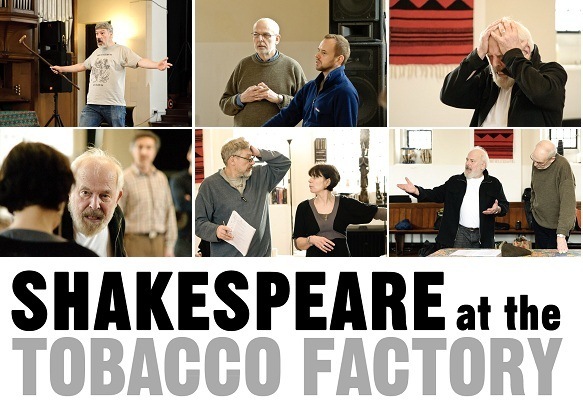 A company producing Shakespeare in a former tobacco factory calls itself Shakespeare at the Tobacco Factory. Such plain logic, alongside respect for verse structure, makes Andrew Hilton’s production gripping, without reducing the play’s dimensions. Staged in the round with a table for the first part and little more furnishing, the good sense starts with the opening line, given context by the Earl of Kent poring over the map of England detailing the way Lear’s about to allocate his kingdom between his three daughters and their husbands. It suggests Lear’s plans have been talked about at court, while Kent’s surprise the map’s boundaries don’t reflect Lear’s various affections reinforces the idea the king’s indulging his feelings, not making rational choices. Illuminating moments run through this first scene. John Shrapnel’s Lear becomes angry at Cordelia only when she shows she’s serious in refusing to flatter him by giving reasons for her behaviour. Till then it’s been all smiles for the favourite daughter who runs on a little late. Yet from the start she’s a match for her sisters and no dutiful Victorian-style daughter. Only when adversity requires love for Lear does she give it unreservedly. Then there’s Lear’s mocking glance at her when picking-up her word “nothing”, his surprise at the King of France taking her without a dowry – and Gloucester’s upon returning to what he’d assumed would be a happy scene. But it’s not just details though that makes this Lear involving. There’s clarity over Shakespeare’s repeated theme of people falsifying their thoughts. Dorothea Myer-Bennett’s Regan is at her softest, most pleading when most unkind, and Cornwall seems to find his own violence shocking. Christopher Staines’ Edgar, as Poor Tom, apparently shivers in insanity while actually curled-up in grief at his estranged father’s new understanding of him. King Lear was written in either 1605 or 1606 and first published in a quarto version in 1608. The Folio Edition of 1623 introduces new material and makes many small revisions, as well as cutting significant amounts of the quarto. The version we use tonight represents our own choices between these two primary texts. In the background to the play is a folk tale about a king or rich man with two, three or more daughters. Known as the ‘Love like Salt’ story, it concerns a love test that the man puts to his daughters and his rage when one of them declares that she loves him as meat loves salt. Versions of the tale are found across Europe and the Far East. The specifically British story of King Leir and the division of his kingdom – set in pre-Roman Britian – is mythical, but enjoys the authority of the British History of Geoffrey of Monmouth (c.1135) and Holinshed’s sixteenth centuryChronicles. John Higgins retold the tale in The Mirror for Magistrates (1574), as did Edmund Spenser in The Faerie Queene (1580-94). There was also an anonymous play, The True Chronicle History of King Leir, performed in London in 1594 and published in 1605. With some variations – particularly in the Chronicle History play – these works, in prose, verse and drama, present much the same story: Leir puts the love test to his daughters; Cordelia refuses to flatter him and is disinherited, but married to the King of France; the two other daughters and their husbands reduce Leir from regal glory to destitution; Leir flees to France to seek help from Cordelia; he is welcomed there, and restored to dignity; Cordelia’s army wins back Britain for Leir who resumes the throne. On his death Cordelia succeeds him as Queen, but is eventually usurped by the sons of Goneril and Regan and put in prison; unable to bear her fate, she hangs herself (or, in Higgins’ version, stabs herself with the knife which Dido used to kill herself). This is the story – or history – that Shakespeare’s audience knew; and he first titled his own play a ‘chronicle history’ rather than a ‘tragedy’, perhaps to avoid alerting his first audiences to the radical reinvention they were about to witness. See excerpts from ‘Love Like Salt’, and the Leir story retold in passages from Spenser, Geoffrey of Monmouth and Holinshed below. Contemporary gossip may also have influenced the play. In 1603 Grace, the daughter of Brian Annesley, a servant to Queen Elizabeth, tried to have her father certified lunatic and “altogether unfit to govern himself or his estate”. Annesley was defended by his other daughter, Cordell, who refused to allow her greedy sister access to her father’s house. King Lear is now widely accepted as one of Shakespeare’s masterpieces, but it was possibly not among the most popular of his plays during his lifetime, and after the restoration of the monarchy (and the theatres) in 1660, it was considered too painful to produce at all. So much so that a version prepared for the actor-manager Thomas Betterton by the Irish poet, Nahum Tate, ended with Lear happily restored to power and Cordelia married to Edgar. It is hard to credit now that this sentimentalised and emasculated version provided the standard performance text until well into the nineteenth century, when Shakespeare’s play was rescued by Kean and Macready. We know that King Lear was performed, perhaps premièred, before King James I in the Banqueting Hall, Whitehall, on Boxing Day 1606. Sitting with the King were his two sons, Henry and Charles. Henry, heir apparent until he died of typhoid in 1612, enjoyed the title of Duke of Cornwall, his younger brother that of the Duke of Albany. Shakespeare cannot have been ignorant of such consonances with his play, nor that he was presenting a story that begins with a fictitious king’s decision to divide the British realm, before a real king whose greatest ambition was to unite it. The political frisson of such parallels and contrasts is now largely lost on us and – despite Alex Salmond’s best efforts – the first mention of the ‘division of the kingdom’ in the second speech of the play no longer resounds as shockingly as it might have done on that day in 1606. Fortunately, the life of this immense and challenging play doesn’t depend on merely topical political relevance, though it is particularly apposite to our time in one respect: around the world totalitarian regimes are threatened from within by an unquenchable thirst for self-empowerment. Revolution in the Middle East is not only in response to the cruelty and corruption of autocratic rule, but also to the humiliation people feel (“I want my dignity!” shouted a man in Benghazi) at being in thrall to the power and mystique of one man; of being, as it were, the President’s children. English men and women alive in the 1590s were all too conscious of the mystique of one all-powerful woman, the vast majority of them having known nothing other than the England of Elizabeth I and her carefully constructed myth of wisdom and magnificence; and though her era was over by the time King Lear was written, the dual memory of her extraordinary dominance, and the fear that the void it would leave when she died would be filled by civil war, still lived vividly in the memory. No doubt these memories fed into Shakespeare’s new version of the Leir story – into the reconceived dénouement, darker but more convincing than any of the source-versions, and into the writing of Goneril, Regan, Cornwall and Edmund, who must at least provoke our understanding if they cannot evoke our sympathy. In the present case the publick has decided. Cordelia, from the time of [Nahum] Tate, has always retired with victory and felicity. And, if my sensations could add any thing to the general suffrage, I might relate, that I was many years ago so shocked by Cordelia’s death, that I know not whether I ever endured to read again the last scenes of the play till I undertook to revise them as an editor. This depth of nature, this force of passion, this tug and war of the elements of our being, this firm faith in filial piety, and the giddy anarchy and whirling tumult of the thoughts at finding this prop failing it, the contrast between the fixed, immoveable basis of natural affection, and the rapid, irregular starts of imagination, suddenly wrenched from all its accustomed holds and resting-places in the soul, this is what Shakespear has given, and what nobody else but he could give. Of all Shakespeare’s plays Macbeth is the most rapid, Hamlet the slowest in movement. Lear combines length with rapidity,—like the hurricane and the whirlpool absorbing while it advances. It begins as a stormy day in summer, with brightness; but that brightness is lurid, and anticipates the tempest. What I wanted to say in the last scene was that humanity must face life without relying on God or Buddha. We must try to the maximum to build for a happy future, otherwise there will be a succession of wars. A reason I couldn’t shoot this film for so long was that producers complained that the ending was tragic. We are always closing our eyes. Once upon a time there lived a king who had two daughters, and he loved them with all his heart. When they grew up, he was seized with a wish to know if they, on their part, truly loved him, and he made up his mind that he would give his kingdom to whichever best proved her devotion. “As the apple of my eye!” answered she. But the king did not like her words, and ordered her to quit the court, and never again to appear before him. The princess went sadly up to her room, but when she was reminded of her father’s commands, she dried her eyes, made a bundle of her jewels and hurriedly left the castle where she was born. Inquired, which of them most did love her parentage? … It happened after this, that Aganippus, king of the Franks, having heard of the fame of Cordeilla’s beauty, forthwith sent his ambassadors to the king to demand her in marriage. The father, retaining yet his anger towards her, made answer; “That he was very willing to bestow his daughter, but without either money or territories ; because he had already given away his kingdom with all his treasure, to his eldest daughters, Gonorilla and Regau.” When this was told Aganippus, he being very much in love with the lady, sent again to King Leir, to tell him, “That he had money and territories enough, as he possessed the third part of Gaul, and desired no more than his daughter only, that he might have heirs by her.” At last the match was concluded, and Cordeilla was sent to Gaul, and married to Aganippus. … In the end, such was the unkindness, or (as I may say) the unnaturalness which he found in his two daughters, notwithstanding their fair and pleasant words uttered in time past, that being constrained of necessity, he fled the land and sailed into Gallia, there to seek some comfort of his youngest daughter Cordeilla, whom before time he hated. The lady Cordeilla hearing that he was arrived in poor estate, she first sent to him privily a certain sum of money to apparel himself withall, and to retain a certain number of servants that might attend upon him in honorable wise, as appertained to the estate which he had born: and then so accompanied, she appointed him to come to the court, which he did, and was so joyfully, honorably, and lovingly received that his heart was greatly comforted: for he was no less honoured, than if he had been king of the whole country himself. Cordelia restores Lear to the throne, then succeeds him as Queen; Goneril and Regan’s sons rebel against her and imprison her; she hangs herself. Till weary of that wretched life, her self she hong. Please click on the button below to view the education pack on our Resources page.